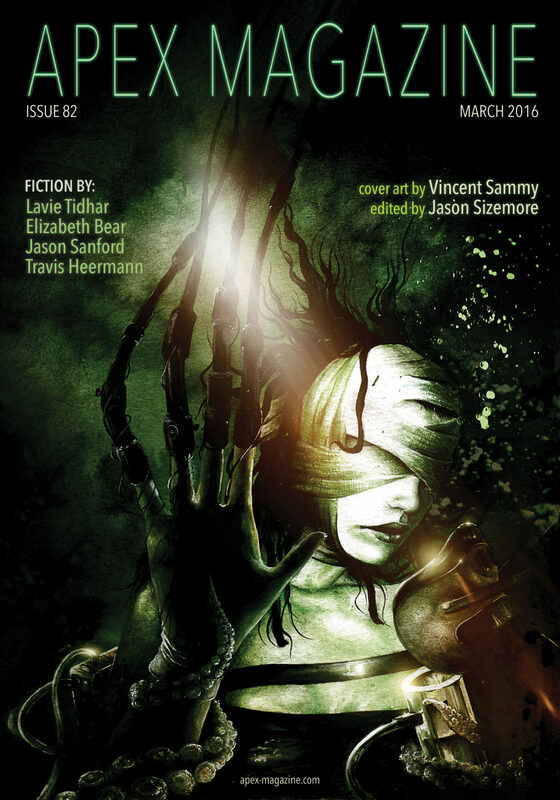 "Death Flowers of a Never-Forgotten Love," by Jason Sanford [bio] (edited by Jason Sizemore), appeared in Apex Magazine issue 82, published on March 1, 2016. Pro: The narrator struggles to decide how to respond to the loss of his/her love as well as the insult of everyone deliberately forgetting they were ever a couple. He/she concludes that the best memorial is to keep the memory of their love alive, even if the whole world forgets. The story has a great deal of poignancy for anyone who knew gay people who lost their partners back before there was marriage or anything like it. Con: What's the point of the narrator being a former death flower? And how can the death flowers magically change all the electronic and physical records in the world? I liked how the AI (maybe more like synthetic human?) told the mom that they'd remember the truth long after everyone there was dust. But the death flower idea doesn't quite work. Surely there was at least one other person who was supportive of their relationship and wouldn't want to forget. Or if the death flowers are programmed to make everyone forget what the mom wants them to forget, who'd subject themselves to that? We all want to remember someone we've lost in our own way. And I can't really imagine how having those memories erased would really make that person's loss any less painful anyway.